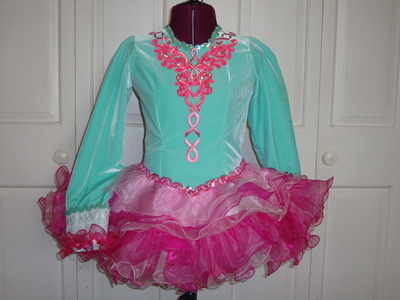 Mint (aqua) green stretch velvet bodice and sleeves with multi-tone pink cupcake skirt. Underskirt is aqua and white gingham check. Bodice is adorned with hot pink sequins and bubblegum pink embroidered design. Crystals to be added before shipping. Dress is still under minor construction-still able to adjust skirt and sleeve lengths if needed. Room for let out as darts are in front and back bodice. Asking Price: $US250. Shipping costs are included for my own country, overseas shipping is extra. Returns are negotiable.